E’ la festa della migrazione. Oggi, 25 ottobre, qui a San Paolo del Brasile si celebra la solidarietà, la carità, l’assistenza, la meravigliosa, incondizionata fede in Dio. Oggi diventa beata Madre Assunta Marchetti, cofondatrice delle suore missionarie di San Carlo Borromeo, meglio conosciute come scalabriniane, dal nome del vescovo di Piacenza, Giovanni Battista Scalabrini, loro fondatore. Madre Assunta è nata in Italia, in Toscana,a Lombrici di Camaiore il 15 agosto 1871. A 24 anni parte per il Brasile come missionaria per aiutare gli orfani dei migranti – molti, all’epoca, italiani – e per dare sollievo, in un primo tempo anche ai figli orfani, degli schiavi e ai bambini abbondonati. Essa e un modello perché svolse eroicamente la sua attività missionaria nel mondo, è un modello soprattutto per le Suore Missionarie Scalabriniane che ancora oggi, in buona parte del mondo, prestano la loro opera missionarie in nome di Dio. L’evento è organizzato dalle Suore Missionarie di San Carlo Borromeo Scalabriniane e dall’Archidiocesi di San Paolo del Brasile, nella Cattedrale metropolitana di San Paolo, a partire dalle 10. La celebrazione eucaristica è presieduta dal Cardinale Odilo Pedro Scherer, arcivescovo di San Paolo e il rito di beatificazione è presieduto dal cardinal Angelo Amato, prefetto della Congregazione delle Cause dei Santi. “Madre Assunta è stata una donna forte, dalla spiritualità straordinaria. Il suo impegno missionario è la conseguenza della sua intensa vita interiore, alimentata dalla preghiera costante: personale, comunitaria e liturgica. Madre Assunta viveva abitualmente alla presenza di Dio, in unione con lui – ha spiegato Suor Neusa de Fatima Mariano, superiora generale delle scalabriniane. La sua vita fu straordinariamente operosa, ma anche tessuta di preghiera, perché la preghiera nutriva il suo spirito e lo faceva trasbordare a quanti le si avvicinavano. A Madre Assunta non mancarono difficoltà e sofferenze, tuttavia questo non alterò mai la serenità e la dolcezza del suo cuore. In Madre Assunta tutto è puro, equilibrato, ponderato e naturale, comunicante bellezza, armonia e interiorità. E’ un modello di vita da contemplare, un esempio di cui permeare il nostro futuro di speranza, una figura di cui proporre lo stile di essere donna, oggi, figura femminile che interpella ciascuna e ciascuno a rendersi disponibile ad aprire nuovi cammini nel mondo della mobilità umana”. A Great Feast for Mother Assunta Marchetti? But who is she? 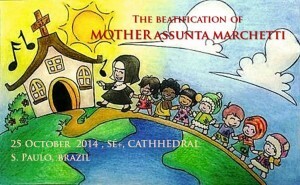 There is a big celebration in San Paulo, Brazil: Mother Assunta will be declared Blessed! 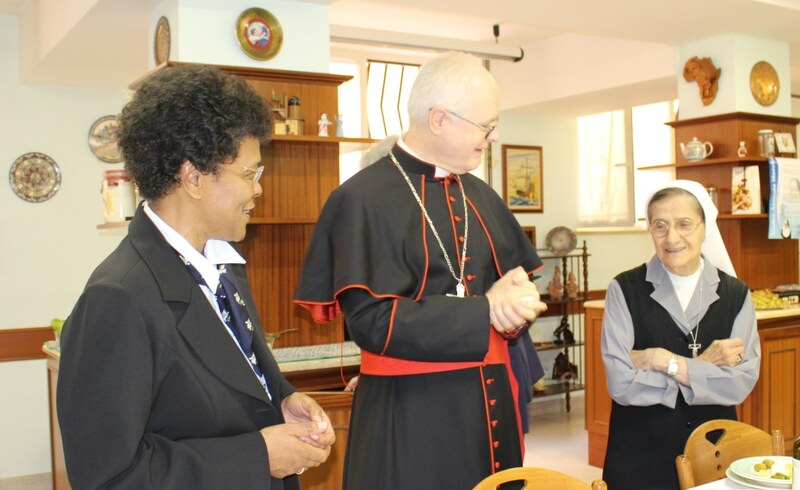 Mother Assunta is a very special person; co-founder of the Missionary Sisters of St. Charles Borromeo-Scalabrinians, and today in a grand celebration for everyone, will become “Blessed”. On the 25th of October, in the Metropolitan Cathedral of St. Paul, the Catholic Church decided to remember her in a special way. But what has Mother Assunta done, that is so important? She was an Italian and was 24 years old, when she chose to leave Europe in the 1800’s, and travelled to Brazil to help the poorest among the poor. She went with great courage, seeking out the Italian immigrants who travelled the long sea route to reach America, in search of new hope for their lives. In fact, in Italy, many families were in misery and had no way to get out of it, other than by emigrating. 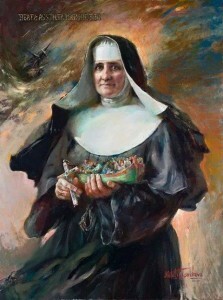 Beatificación de Madre Assunta Marchetti. 25 de octubre de 2014 – Catedral Metropolitana de San Paulo, Brasil. Nació en Lombrici di Camaiore (Lucca) el 15 agosto 1871 y murió el 1° julio 1948 en São Paulo (Brasil), en el Orfanato Cristóbal Colón, junto a las huérfanas como siempre había querido. Ella, como Jesús, “Pasó la vida haciendo el bien a todos”. Assunta Marchetti was born in Lombrici, a small town of Camaiore in the Lucca area of Italy, on August 15, 1871 and was baptized the next day. She is the third of eleven children, the first girl of the humble family of Angelo and Carola Marchetti. Since her infancy, she was raised in the principles of the Christian faith. Her formation was particularly influenced by her aunt Caterina who was a religious and director of the school where Assunta learned a modest cultural heritage, as she could not remain there long for family reasons, the mother’s poor health and many children. Aunt Caterina collaborated to instill love for the Christian virtues in the young lady’s heart. In 1883, Maria Assunta was confirmed at five years of age; receiving the First Eucharist at age twelve. She continued, if she could daily, to receive the Eucharistic Lord whom she learned to love and follow as the only God. Gifted with strong vitality and inner energy, she knew how to manage it for the good of others, becoming servant at home with the youngest siblings and even replacing her father in the work at the mill. While still an adolescent, she felt the call to the cloistered religious life but had to postpone her entrance in the cloister because her brother Joseph wanted to become a priest and the family with scarce resources could not afford the departure of both. Assunta remained at home and continued to help her parents and siblings. 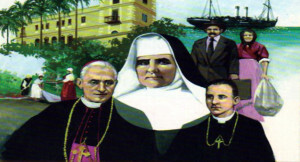 In 1895, when Father Joseph, a missionary among the Italians who had emigrated to Brazil, asked her to be missionary in a distant land where many countrymen “were born and dying like animals”., Assunta at 24 years of age, before the image of the Sacred Heart of Jesus, discerned and decided to say Yes to the Lord who was calling her through her brother and the cry of countrymen who by emigrating sought the bread which was scarce in their homeland. She set out for Piacenza with her missionary brother, her Mother and two other companions, to go to see Bishop Giovanni Battista Scalabrini. And on October 25, 1895, she pronounced her first religious vows in the hands of the Bishop Founder, Blessed John Baptist Scalabrini. On October 26,1895, she became “migrant with the migrants forever,” boarding a ship together with many poor people who, disappointed in the homeland, were leaving with the hope of finding bread elsewhere. During the long crossing, she took advantage to catechize 83 children who upon arrival in Brazilian lands received first Holy Communion. Having settled in Brazil Assunta began her mission in the Christopher Columbus Orphanage, Ipiranga, San Paulo, where she was mother, nurse, and a sort of factotum (jack of all trades), caring for the small children and promoting the growth of faith in every one that arrived at the orphanage. Sister Assunta had no pretenses. With ready availability she accepted the various services that were needed with tenderness and kindness towards all the orphans and sisters. In October 1897, she made her first perpetual profession (privately) in the hands of Fr. Faustino Consoni, delegate of Scalabrini, Bishop-founder. 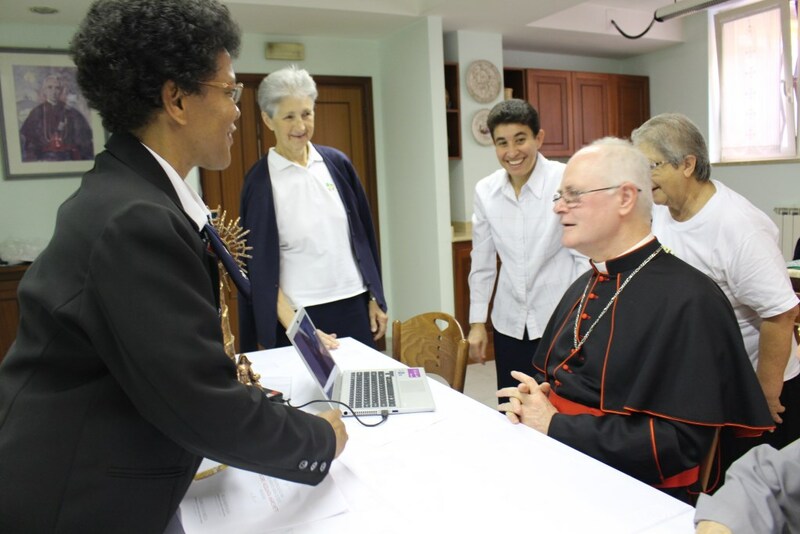 The Institute underwent various crises, but the storms gradually calmed down and God blessed the emerging Congregation with new vocations and missionary beginnings in places of Italian migration. As an expression of her surrender to the Lord together with the migrants who sought their bread far from their homeland, Assunta profoundly loved He who was calling her. She became the servant of all, performing different tasks with true humility and genuine charity: catechist, educator, nurse, cook and superior general. Always aware of “being a useless servant” spreading the precious nard of love” wherever she went: especially in the orphanages, in the parochial schools and in the Houses of Mercy for the sick. In the villages dispersed among the mountains and where the doctors could not go, she went on horseback or by wagon to take medicine for the body and to be the presence of God’s mercy. In the religious communities, she was an example of a consecrated religious, a woman of lively faith, charitable towards the neediest and the simple servant of the sisters of the community. She was a hopeful person because she relied on the God of hope who sees and provides for his children. During the trials of life, she was serene and balanced. She knew how to be silent, forgive and serve with discretion. Confident of the love of the ‘heavenly bridegroom’, as she habitually called him, Assunta dedicated herself to the service of the neediest persons, as well as to night hours of adoration in the twilight of the small chapel. She had a filial relationship with the Blessed Virgin Mary – always keeping in her hands the holy Rosary that she willingly recited while going from one bedside of the dying to the other or while watching over the sleeping children of the shelter. She was strong, meek and trusted and often said: “God sees, God provides”. And so it came to pass in her life of faithful believer. Three times she had to make the novitiate because of undue interference in the Institute, but she remained a determined guardian of the female Scalabrinian charism. For this we consider her a sort of “cornerstone” of the building of the Congregation of the Missionary Sisters of St. Charles Borromeo – Scalabrinians. 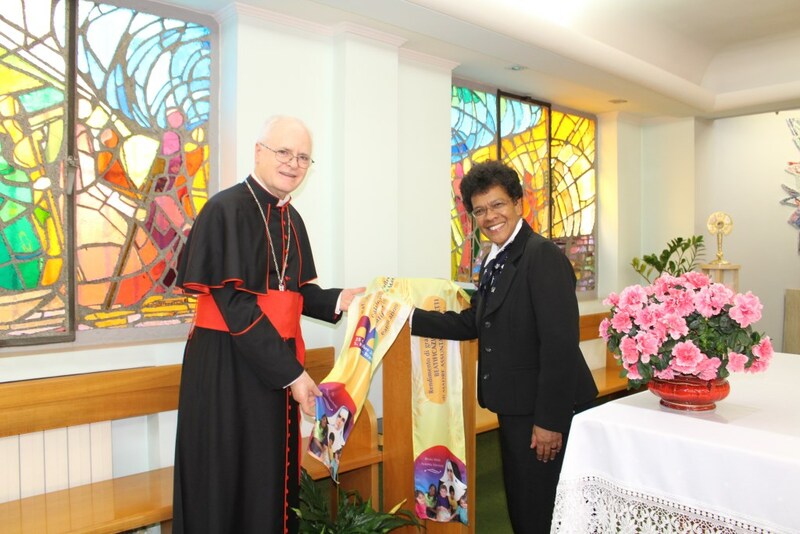 She was superior General of the Congregation for three terms and served in different missions, always a lively expression of her self-giving to the “heavenly bridegroom”. In illness, she was patient and detached from herself, always attentive to others. Her wish was to die among the children of the orphanage and so it happened. She departed for the heavenly Father’s House on July 1st, 1948 at Villa Prudente, San Paulo, Brazil. The cause of beatification began on June 12, 1987, in San Paulo, Brazil. In view of the beatification of the Servant of God Mother Assunta Marchetti, the postulation of the Cause presented an alleged miraculous healing, attributed to her intercession, to the judgment of the Congregation for the Cause of the Saints. The incidence in question occurred in 1994, in the Diocese of Porto Alegre, Rio Grande do Sul-Brazil. It concerned the complete recovery of the health of Mister Heraclides Teixeira Filho who had suffered a serious heart attack that lasted for about 15 minutes and left no consequences. It happened in this way: while the doctors were trying to save his life, the hospital Sisters and some family members were invoking Mother Assunta’s intercession in the small chapel. The healing occurred miraculously. This extraordinary healing provided the basis for the Beatification of the Venerable Servant of God Mother Assunta Marchetti. 2011 – On December 19, 2011, Pope Benedict XVI, signed the Decree on the heroic Virtues, giving her the title of Venerable Servant of God. 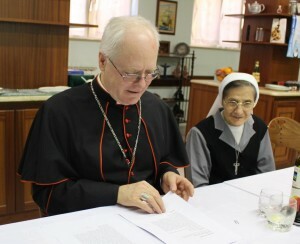 2012 – In February the Medical Committee of the Vatican Congregation for the Causes of Saints declared as scientifically inexplicable the healing of Mr. Heraclides Teixeira Filho in the Mãe de Deus Hospital, Porto Alegre, Brazil, through the intercession of the Servant of God mother Assunta Marchetti with the prayers the Scalabrinian Sisters of the Hospital and some family members. 2013 – On October 09, Pope Francis authorized the Congregation for the Causes of the Saints to promulgate the Decree on the miracle which occurred in 1994 through the intercession of the Servant of God. 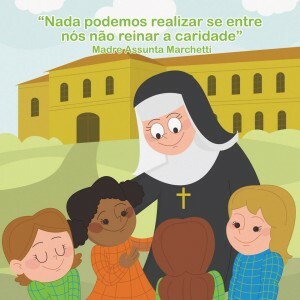 2013 – On December 17, the Vatican State Secretariat announced that the Holy Father Francis allowed that the celebration of the Rite of Beatification of the Venerable Mother Assunta Marchetti be conducted on October 25, 2014, in San Paulo, Brazil.